As part of our affiliate program we are going to introduce Fightlings by Thoughtfish to you today. 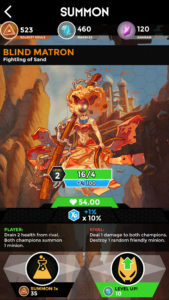 Fightlings is a Collectible Card Game (CCG) that you play by exploring the real world with two exciting game modes. For one, you can collect and research creatures and objects by using the world map. On the other hand, you can fight players around the world in an entertaining battle mode. We put together a short list of aspects that illustrates why we think Fightlings is an amazing game that is comprehensive and diverting at the same time. If you want to try the game yourself just scroll to the bottom where you will find the download links for Google Play and the App Store. The creatures in Fightlings correspond to collectible cards that you can find or buy and level up during the game. The developers of Thoughtfish put a lot of thought and love into the creation of their creatures, no matter if it is a Fightling, a Minion or a Champion. Both the design and the names and descriptions will make you smile once in a while. It may always happen that after opening a portal you will encounter a Miracle Worker, a Wandering Ghost or a Toxic Moose. Because of the innovative battle system Fightlings never gets old. 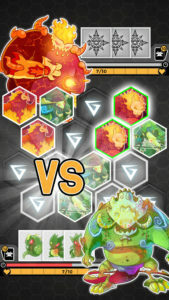 Instead of throwing single attacks at your opponent, you compete with them in a turn-based pairs game fight. Here, every uncovered pair of Fightlings has an effect on the player’s and the opponent’s Clan Leader. Additionally, every player has a set of Minion cards that also have a bearing on the course of the battle. To win the battle the opponent does not have to be completely destroyed. Instead the round automatically ends once all pairs have been uncovered. Stamina and a well filled HP bar are the key to winning the game. A good memory and an effective strategy help the player on their way to success. Each clan corresponds to a fixed deck of cards consisting of a Clan Leader, four Champions and 12 Minions. The first Champion you get to play with is part of the Clan of Herbs and no, their ability is not smoking pot. The Fightlings and Minions of the Clan of Herbs are specialized in buffing and debuffing to stay alive until the battle ends. By gathering six different kinds of Souls you can unlock new clans with their own distinct features throughout the game, such as Wind, Sand, Innocence, Fire, Phantom or Loyalty. The Clan of Loyalty, for example, specializes in resurrecting their fallen Minions to send them into battle once again. 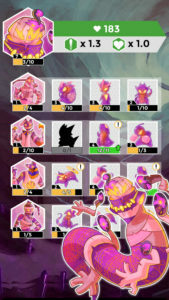 One of the best features of Fightlings is definitely the gathering mode. 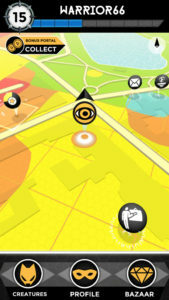 With the help of Thoughtfish’s specially developed COALA (Context-Aware Location Assessment) System the app is able to accumulate different informations sources based on the players location and environment and implement them into the game. This means that the player’s location (city, park, bodies of water) as well as the environmental conditions like weather influence the collectible items and creatures. Thus, the player sometimes needs to be in a certain place, at a certain time of the day with certain weather conditions to achieve certain rare objects. In addition, you can find unique places like drug stores, underground stations, museums and more on the map that will usually have a funny description and fulfill a special purpose. So it is always worth to explore your surroundings. It is also worth to mention that Fightlings has already been nominated twice for German game awards, the German Developers Award 2016 and the German Computer Games Award 2017 in the category “Best Innovation”. It seems like we are not the only ones thinking that Fightlings is a great game. If you do not believe us, just click on the download links below and check out the game for yourself.